It is important to help your child understand the importance of a consistent oral care routine. If a routine is established early on in their lives, it will be second nature for them for years to come. 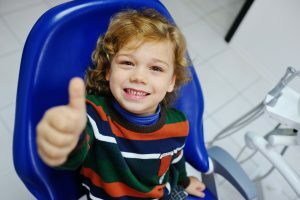 It isn’t always fun going to visit the dentist, but you and your child can have a much better time if you follow these easy tips! Before your child even has teeth, you can get them in the habit of brushing. Silicone sleeves go over your finger that simulate brushing. Your child is already familiar with this since they use a bottle, but this reinforces the notion that brushing is a good thing. Scrubbing their gums will get them prepared for using a regular toothbrush when the time comes. Next, it is important to set a time limit on brushing. Most adults are encouraged to brush for two to three minutes, so a song fits perfectly for children’s brushing. When your child gets old enough, you can have them select their favorite song and have them brush their teeth with it. Before then, choose something soothing that puts your child at ease while you get them ready for a lifetime of brushing. When selecting a brush for your child, make sure to get an appropriately sized toothbrush. You don’t want to buy an adult toothbrush for your two-year-old. It will not work nearly as well as a children’s toothbrush. The sizing will make a huge difference for the comfort level of your child. Brushing isn’t the only activity that will help take care of a child’s teeth. Flossing is important and is just as important as brushing. A toothbrush cannot get in between your teeth like floss can, and incorporating this into your child’s routine early on is critical. As soon as your child’s teeth begin to appear and touching one another, they need to start flossing. Flossing prevents cavities and other dental problems. By starting early, you are reinforcing the idea that oral care is a fun and necessary activity to do each and every day. When your children are older, they will be thankful for the healthy habits you have taught them. If you have any questions regarding your child’s oral care routine, contact us today!